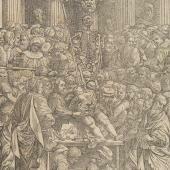 The frontispiece of the Fabrica shows Vesalius taking centre-stage in an anatomical theatre, teeming with spectators. 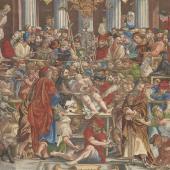 It is a pictorial manifesto of his project to revive ancient anatomy. 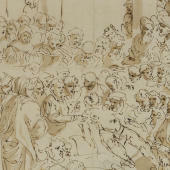 The main compositional elements of the frontispiece are readily identifiable from a sketch now in Stockholm. The woodblock of the frontispiece of the Fabrica was also used for the Epitome, which was printed on a larger size of paper, and thus had space underneath it to explain the contents of the book. The Cambridge copy of the Epitome is coloured by hand, so it is possible to compare the different visual effects between coloured and un-coloured woodcuts. When the Fabrica was revised and published in 1555, a new frontispiece was cut, based on the first edition with a few small differences. We do not know for certain who designed or cut the woodblocks for the Fabrica, though they were made in Italy before being sent off to Basel. 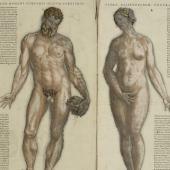 We do know that Jan Stephan Calcar (c. 1499-c. 1546), a Flemish artist who worked under Titian around 1536 or 1537, made the woodcuts for Vesalius’s earlier publication, Tabulae anatomicae (Anatomical tables) (1538), since he is named there. 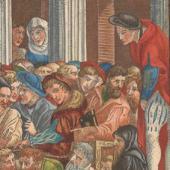 However, apart from Vesalius’s portrait in the Fabrica that is reminiscent of Calcar’s portrait of Melchior von Brauweiler (1540), there is no independent evidence to tie Calcar’s name to the Fabrica. On stylistic grounds, it has been suggested that Domenico Campagnola (c. 1500-1564), painter and printmaker who was also a follower of Titian, may have been responsible for the design of the frontispiece and other images in the Fabrica. Given the evident debt to Titian’s style, Titian himself (c. 1485-90 -1576) has sometimes been credited with the Fabrica figures, but there is no basis for this attribution. 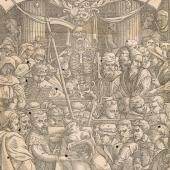 Whoever the draughtsman was, it is clear that he worked very closely with Vesalius, and whoever the cutters of the woodblocks were, they pushed this medium to an extraordinary level of detail and expressiveness.